Palme D’Or, Ecumenical Jury Prize, Palm DogManitarian Award, Cannes Film Festival; Best Actor (Dave Johns) & Most Promising Newcomer (Hayley Squires), British Independent Film Awards; 10 other wins, 20 nominations. 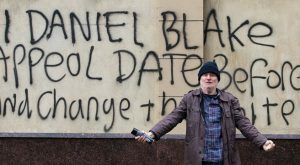 Ken Loach’s I, Daniel Blake stands as a furious raging against a privatized and punitive system more intent on lowering the statistics than caring for those in need. Set in Newcastle, Paul Laverty’s script tells the story of Daniel (Dave Johns), a genial, working-class man who, following a heart attack and a fall at work, has been ordered to stay home. The “healthcare professional”, on the basis of mountainous forms and questionnaires, deems him fit for work and withdraws his sick pay. Daniel is caught in a Catch-22 situation: if he appeals the decision he can’t claim job seekers allowance; if he claims jobseeker’s allowance, he can’t appeal the decision. Plus if he gets a job, he will be doing so against his doctor’s orders and at a very real risk of his health. The frustration of a simple and honest man stumped by a mind-numbing bureaucracy and an idiot help centre expressly designed not to help is beautifully captured and moves from comic exasperation, to tragedy, to farce and back to tragedy again. In the middle of his travails Daniel meets Katy (Hayley Squires) a young single mother who in another absurdity of the benefits system has been moved from London to Newcastle with her two children to fend for herself. Daniel sees the family’s plight even more severe than his own, and finds some relief in helping out, entertaining the children, giving Katy a hand with household upkeep, and accompanying her to the food bank, where the latter makes for a particularly heartbreaking scene. Loach is obviously on the side of the marginalized, but he sees in a nonsensical system a faint glimmer of solidarity. The food banks are awful, but the women working there are sympathetic and even the functionaries of the system suffer from the ironies inherent in their position. The system is inhumane, but occasionally people will surprise you with their own humanity. And I, Daniel Blake sings with humanity.